Ghosts lurk in the bamboo forest outside the tiny northern Japanese town where Satomi lives with her elusive mother, Atsuko. A preternaturally gifted pianist, Satomi wrestles with inner demons. Her fall from grace is echoed in the life of her daughter, Rumi, who unleashes a ghost she must chase from foggy San Francisco to a Buddhist temple atop Japan's icy Mount Doom. 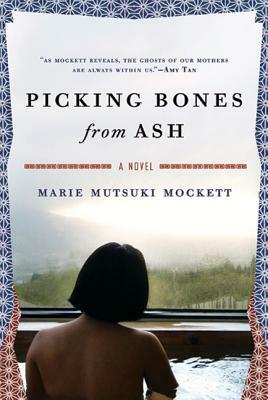 In sharp, lush prose, Picking Bones from Ash - by Marie Mutsuki Mockett - examines the power and limitations of female talent in our globalized world. Marie Mutsuki Mockett was born to a Japanese mother and an American father. Her Japanese family owns and runs a Buddhist temple that has, among other things, performed exorcisms. This is her first novel. At the beginning of the book, Satomi says: “My mother always told me there is only one way a woman can be truly safe in this world. And that is to be fiercely, inarguably, and masterfully talented.” Is Satomi safe in the end? At what cost? And what about the other female characters, particularly Akiko and Rumi? What does it mean for a woman to be safe? Satomi seeks out Western music in Paris, Timothy yearns for spiritual enlightenment through Buddhism, and François reinvents himself in San Francisco. Discuss the ways in which these and other characters—and perhaps you yourself—find freedom through other cultures, and comfort in what is native. On page 246, Satomi tells Rumi, “Here we are. A girl without a mother and a girl with too much of a mother. Which, I wonder, would most people rather be? One inherits history. The other is free to create it herself.” Do you think it is better to inherit history or to create a history for yourself? François teaches Rumi the importance of seeing beauty out of context. How does this skill help her later on? How does it relate to the Buddhist notion of seeing through illusion? Why do you think the ghost of Akiko revealed itself to Rumi and not to Satomi? Masayoshi says: “When parents and children can accept each other—no matter what that means—their relationships with everyone else will change” (page 272). How do you feel about this statement? How did Mockett’s use of interlocking stories and voices affect your reading experience? Mockett has said: “I felt it was important that any supernatural elements in my novel would be grounded in psychological truths, because that’s the ‘reality’ of true supernatural experiences.” How does the supernatural function within her story? Does it add atmosphere? Did it detract from the story? On page 224, Akira says: “The world of the living can be like that of the dead. It is tragic when we lose ourselves in grief.” What do you think about this statement? Is it something that you or someone close to you has experienced? At the end of the novel, Akiko says to Satomi: “You look like a loved person. It always shows on people’s faces. The ones who discover love when they are much older always look startled.” Do you agree?